It’s that time of year again when second and third level students are contemplating their future options. They have most likely already attended careers and jobs fairs and now, they are about to fill in their CAO forms. 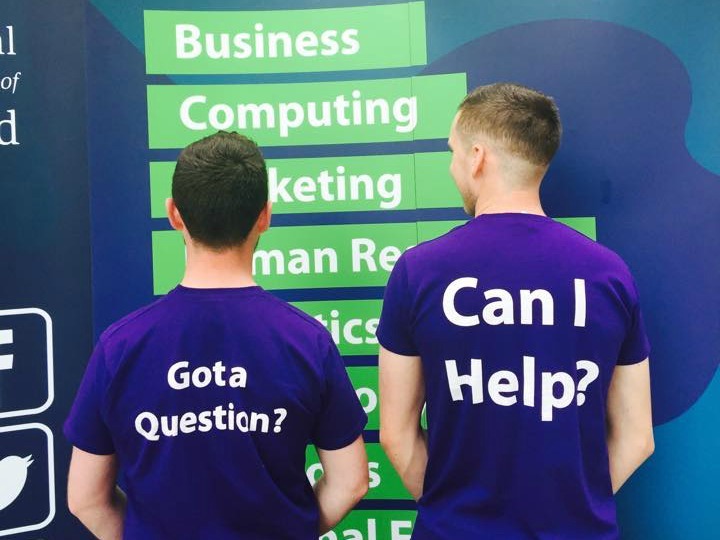 One of the biggest event for students was the Irish Times Higher Options Expo in the RDS with thousands of students from across the country. It’s a fantastic opportunity for students to speak to third level colleges to hear about what’s on offer and to find out more about pursuing courses that will allow them to progress on to the career’s they have dreamed of. Sometimes with all the hustle and bustle students can be too shy or overwhelmed by the big crowds to ask those really important questions. We have put together a list of the FAQ to get students thinking of what kind of questions are important to consider. Q1. Is NCI a private college? In essence no, NCI is not a private college. Students who enrol on our undergraduate courses are eligible for the free fees initiative and student grant scheme (SUSI). However, the BA (Hons) in Psychology at NCI does not qualify under the Free Fees Initiative. Students who enrolled on this programme in the past, and were eligible for a grant, received funding from SUSI to cover either 100% or 50% of the course tuition fees. Please contact SUSI directly to see if the grant will cover the contribution costs for 2018/19. Still confused? Have a look at our recent blog post which should clear up any questions you have regarding funding for the BA Hons in Psychology at NCI. Q2. Do you need a second language to attend NCI? No, unlike some other colleges, students are not required to have a language other than English to obtain entry to our courses. Q3. When is your Open Day? NCI’s next full-time open day is on Saturday 20th January at our city-centre campus in the heart of the IFSC, from 10am to 1pm. Q4. What are the entry requirements for your courses? The minimum entry requirements for all our level 8 courses* at NCI are a grade H5 and above in two higher level subjects, together with a minimum of O6/H7 in four other subjects. A minimum of grade O6/ H7 must be obtained in English and Mathematics. *Excluding the BA (Hons) in Accounting and Finance. A minimum of grade O6/ H7 must be obtained in English and a grade O5/H6 must be obtained in Mathematics. Students who meet these requirements are eligible for entry to all our courses at National College of Ireland, provided they also achieve the required CAO points. Q5. Can you tell me more about the Psychology course at NCI? The BA (Hons) in Psychology at NCI is a three year full-time level 8 degree accredited by the Psychological Society of Ireland (PSI). Students who undertake this course will gain a solid understanding in all the core areas of psychology including Clinical psychology, Organisational psychology and Forensic psychology. Upon completion of the course graduates can progress to postgraduate programmes at level 9 in clinical, educational, occupational and counselling psychology. If you have any further questions about undergraduate education at NCI, please drop our school liaison officer, Karen, an e-mail on Karen.campbell@ncirl.ie. Post originally written in October 2017 and updated in January 2018.